Livingston Cellars -- commonly referred to as Livingston -- is one of the largest producers of wine in the United States. The California winery offers a wide range of wines. Livingston makes a variety of lighter white wines, such as chardonnay; sweet, dry blush wines such as white zinfandel; sangria; and full-bodied red wines such as Merlot and Cabernet Sauvignon. 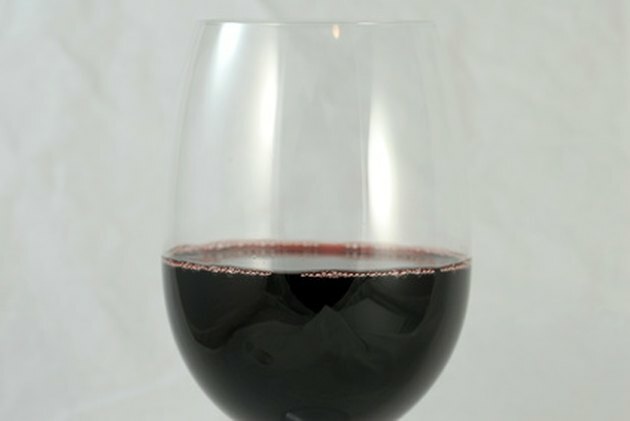 Merlot is a popular full-bodied red made from the Merlot grape and characterized by a dark purple color. It can be enjoyed alone or paired with foods and dishes to complement meals. Livingston Merlot features a variety of flavors, including ripe raspberries and cherries, that create a soft finish and character. As a result, the Merlot is considered to be in between the Cabernet and the Chianti, as it isn't as full bodied as the Cabernet and isn't as fruity as the Chianti. Serving sizes for Livingston Merlot are measured in fluid ounces. One 1-oz. serving contains about 25 calories, and a 4-oz. glass of Merlot has about 100 calories. Merlot is naturally fat-free and cholesterol-free, and it contains only small amounts of protein. With the absence of fat and only small amounts of protein, the majority of the calories come from carbohydrates. One 4-oz. serving of Livingston Merlot contains 3.5g of carbohydrates. The carbohydrates in Merlot come from the naturally occurring sugars found in the grapes. Merlot contains only small amounts of various vitamins and minerals, but does contain certain "heart healthy" components. According to the Mayo Clinic, red wine such as Merlot contains antioxidants and "good" cholesterol that can prevent heart disease and protect against artery damage. Resveratrol found in the red wine also helps to prevent damage to blood vessels and prevents blood clots. Livingston provides several recommendations for dishes to pair with Merlot. Recipes provided on the Livingston website include minestrone, Mediterranean artichoke pasta and grilled Alaskan salmon.